From the infamous to the freshest of local and international talent, this prodigious congregation will allow us a glimpse within the diverse shadows of id and ego…of overall mind and encompassing soul guaranteed to intrigue, disturb, inspire or repulse. 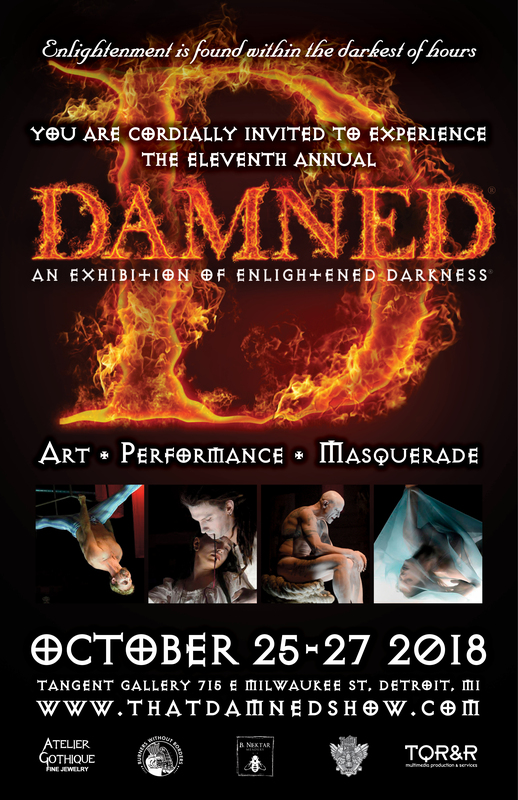 Rising from within the ashes of Detroit’s historic institution of Devil’s Night, this is not Halloween-themed art but an immersion within the immeasurable realms of consciousness through an elegant ambiance of live ethereal music and cirque/butoh-inspired performances. 10/25 “The Darkness” – A night of introspective exploration within the shadowed and primal essence of self. This opening night features an intimate VIP Preview/Artist Reception, absinthe tasting, an on-site chef preparing hot hors d’œuvres and experimental aerial and butoh-inspired performances. 10/26 “The Enlightenment” – A night of the extrospective self enlightened through light, fire and the ethereal. 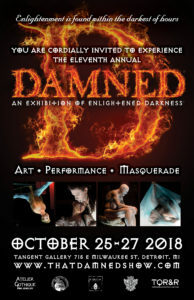 This gala night features an on-site chef preparing a sampling of internationally-inspired tapas with flavored mead tasting courtesy of B Nektar Meadery and exotic fire, aerial and experimental performances. 10/27 “The Masquerade” – A festive celebration through a menagerie of exotic cirque, sensual rhythms and masquerade. This closing night features the formal mask-mandatory masquerade ball, 13-dish strolling dinner prepared by on-site chefs, Ginger Devil whiskey sampling courtesy of Rusted Crow Spirits, sensuous dance performance interludes, the aural ambiance of DJs Josh Burge (Plastic Passion) and Slofu (Happy Endings) with a menagerie of strolling cirque performances all night. Each night also offers a lush Moroccan-inspired VIP Lounge, a gallery store to purchase art, our Devil Girl hostesses and, of course, the art. 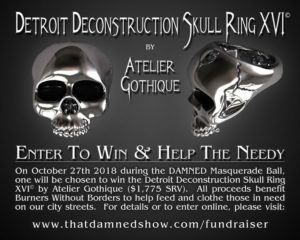 HELP US HELP DETROIT’S HOMELESS: At midnight during the masquerade ball, a single winner will be chosen to win a unique and exquisite prize: The Detroit Deconstruction Skull Ring© ($1,775 SRV) created by avant-garde fine alternative jeweler Atelier Gothique. All proceeds from the raffle will go to benefit our favorite charity, Burners Without Borders, to help feed and clothe those in need on our city streets through the hand packing and one-on-one giving of survival backpacks. For further details, or to enter online, please visit the AG Fundraiser page.